Did not put a foot wrong in goal for Liverpool, although he did not have a lot to do. Looked comfortable for set pieces and made a important save in the last couple of minutes to deny Olympiacos a goal. 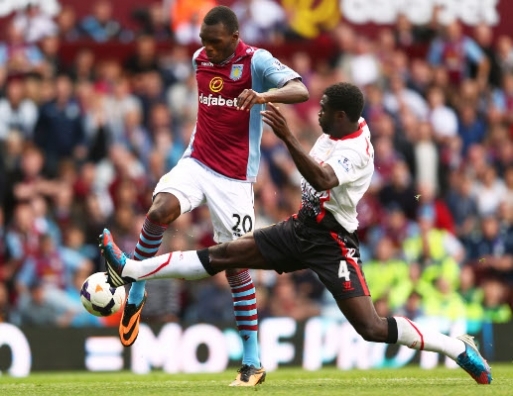 Johnson was Liverpool’s worst defender on the pitch. He constantly gave the ball away in dangerous areas and would not get back down the pitch for his defensive duties when going forward. Johnson did nothing to please Liverpool fans who want Johnson out of the team for the coming season. Looked comfortable at the back and passed the ball very well while in danger. Got forward a couple of times, but looks more assured in his defensive job. Kelly performed better than Johnson when he was on the pitch, making Liverpool a lot tighter at the back. Skrtel was superb at the back for Liverpool today and showed manager Brendan Rodgers that he remains Liverpool’s best defender. 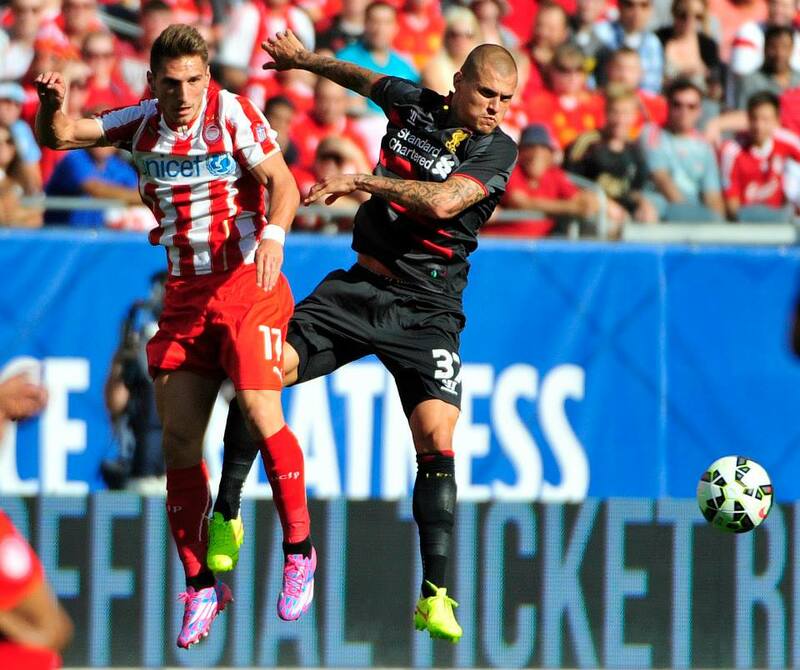 Skrtel made a number of key interceptions in the game to stop certain goals and looked comfortable while on the ball. Skrtel was dominant in the air winning every header, proving that Lovren should partner Skrtel at the back for Liverpool this season. Toure Came under fire a lot from Liverpool fans last season after a number of costly errors, but put in a comfortable showing for Liverpool in this game. 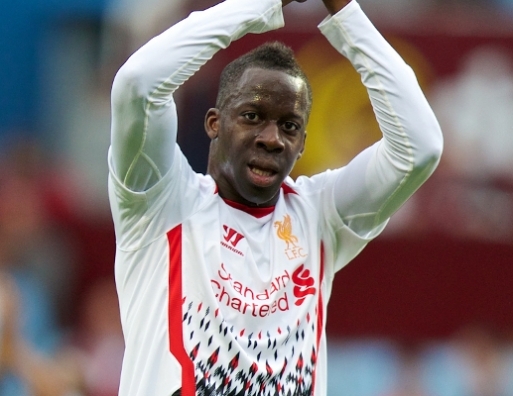 Toure is currently Liverpool fifth choice defender showing they have a vast number of defensive options if needed. 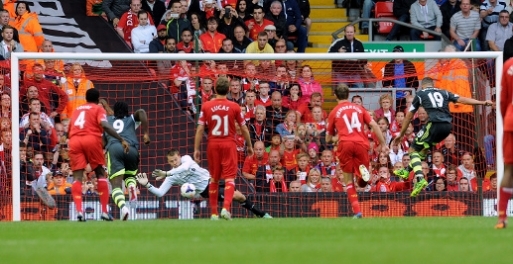 Coates put in another comfortable showing for Liverpool but it currently way behind in the pecking order for the Reds. Looked solid in the air and showed he is a solid defender that could put him in the shop window for clubs that are interested. Enrique looks to have recovered from the injury that plagued him last season after another impressive first half showing here. Made some critical interceptions and tackles and got forward when he needed to. Robinson got forward a number of times but lacks a final ball that will make him a better player, which will hopefully come with experience. Comfortable in defence but was vulnerable when he galloped forward too many times. Gerrard showed all of his experience in this game and does not look like he needs pre-season to prepare himself for the coming season. 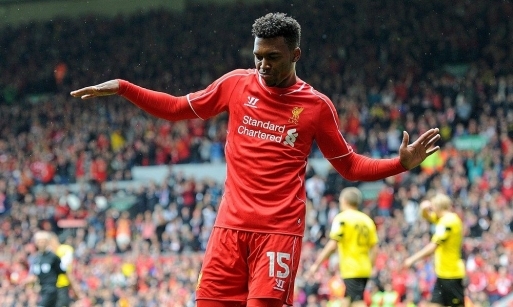 Controlled the tempo of the Liverpool play and made a delightful pass to Sturridge in the build-up to the goal. Made some great tackles and passes in the game and showed why he is such an important player to Liverpool for the coming season. Can only played 45 minutes but looked impressive during the time he was on the pitch. Can showed he’s got good pace and strength to succeed in the Premier League. 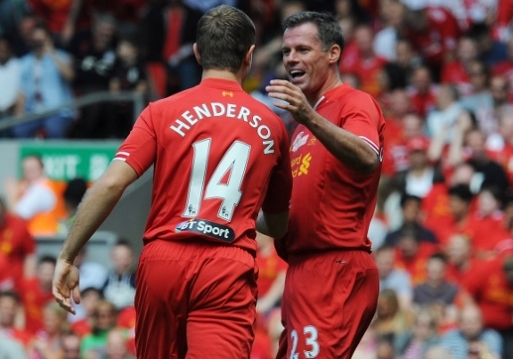 Henderson played the full 90 minutes and showed what an engine he has. Ran all day and showed great link-up play with his fellow midfield players and forwards. Henderson will be a key player for Liverpool this season with his engine and work effort being pivotal to the Liverpool cause. Lucas has a point to prove to Rodgers to prove he should be in Liverpool’s first team plans, but on the basis of this performance Liverpool have better options. Gave away a number of needless free-kicks, which he consistently does, and did not look good on the ball. 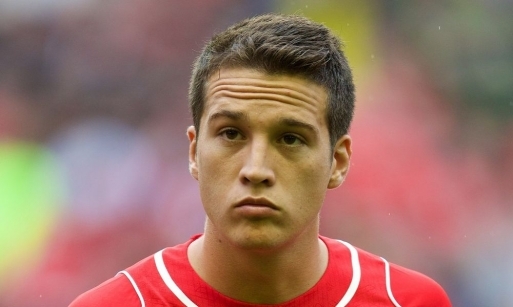 Allen had a very similar performance to Lucas and ultimately failed to impress once again. 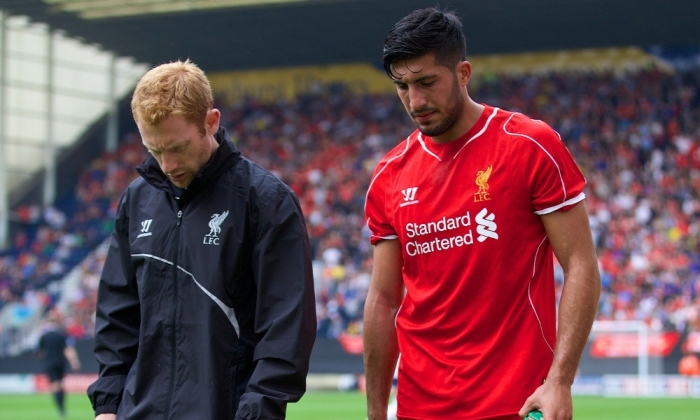 Allen gave away the ball a number of times, with one of them very nearly costly. 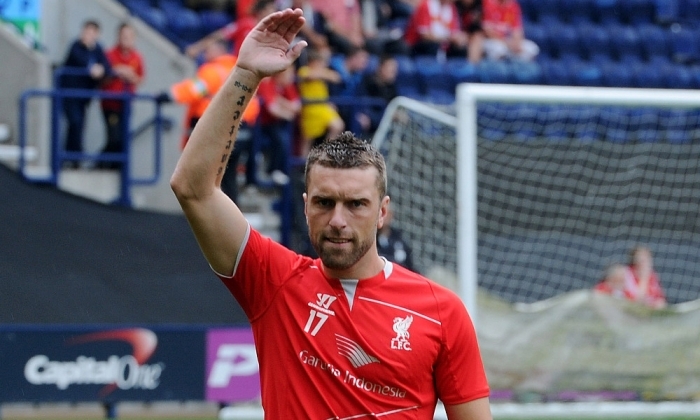 The Welshman could not get his passing together and ended a number of Liverpool attacks. 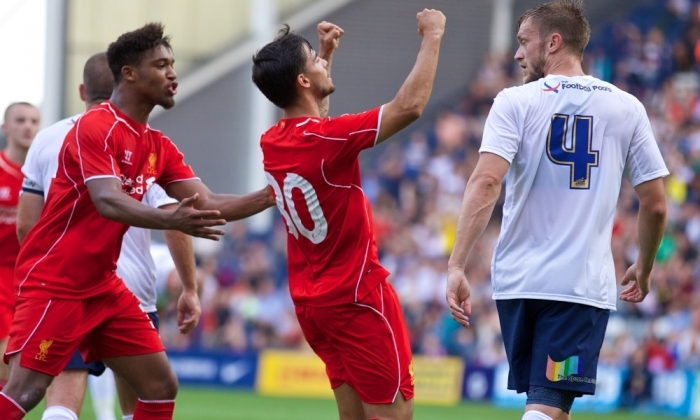 Markovic made an impressive debut and gave glimpses of what he is about. 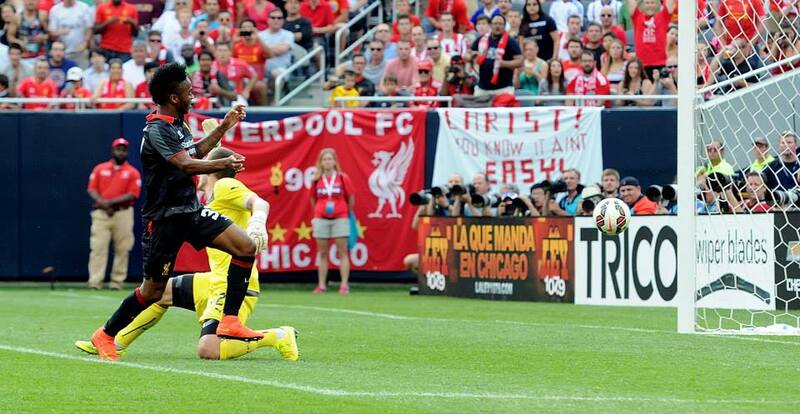 Markovic was at his best when running at defenders and had a decent chance but curled it over the bar. 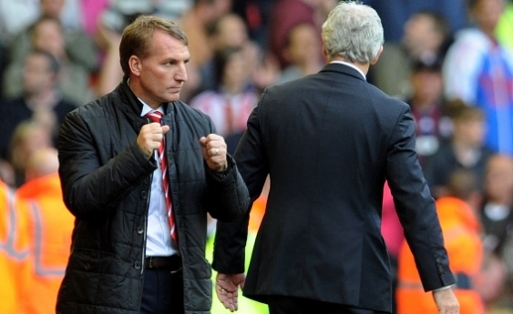 The Serbian showed Rodgers he could be a key player this season after showing good signs here. Sterling scored the only goal of the game and showed great instinct and finishing to get into the position and finish it off. Sterling looked lively all game and was always on the move. 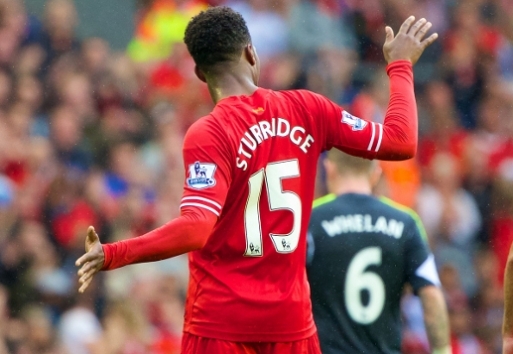 With the departure of Suarez then Sterling could be in for a big season this year. 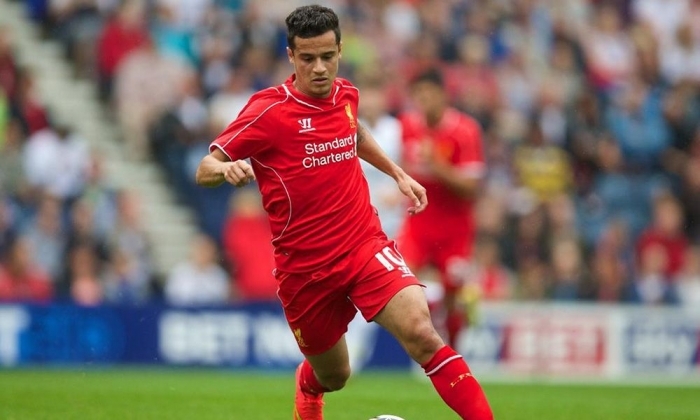 Coutinho looked good on the ball and always looked dangerous on the ball. 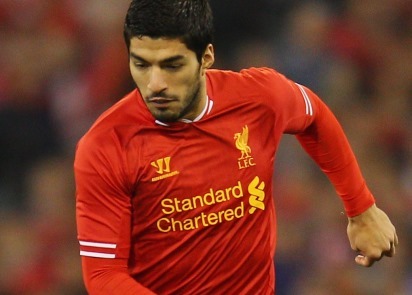 The Brazilian looks more dangerous when playing in a more central position but still threatened from the wing. 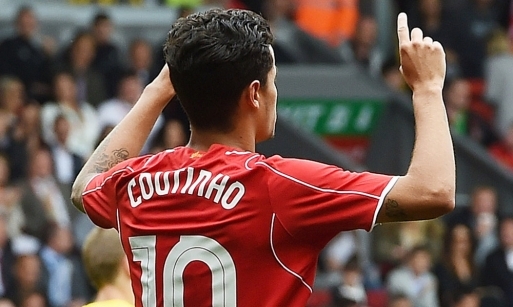 Coutinho made a number of superb passes and linked up well with the forward players. 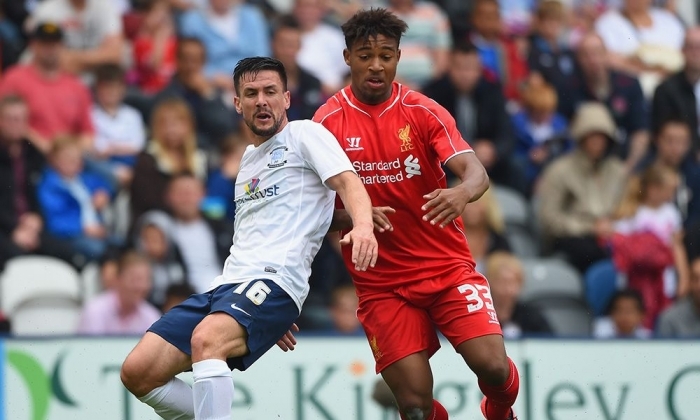 Ibe did not get to many minutes to make his mark on the game but looked lively. Ibe made a number of good runs and put in Joe Allen for a great chance at the end of the game after a superb run and pass. 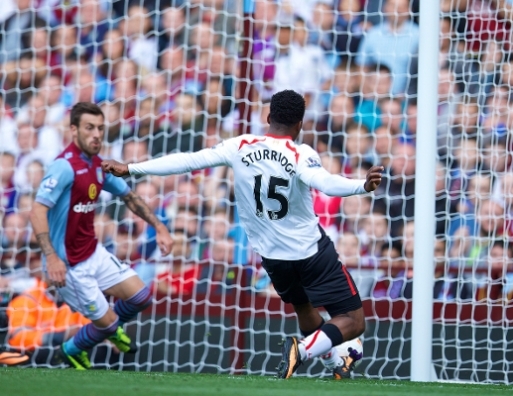 Sturridge had a very quiet game in front of goal but showed goo link up with the midfielders. The England international scuffed a shot that deflected to Sterling for the goal but did not have the chance to get around the box as he would have liked. Lambert came on in the closing minutes off the game but held the ball well up front to take the pressure of the defenders. Take part in the pole above or comment below who your man of the match was! It was an iconic day at Anfield today as the fans paid tribute to Kop legend Steven Gerrard’s legendary one club career. 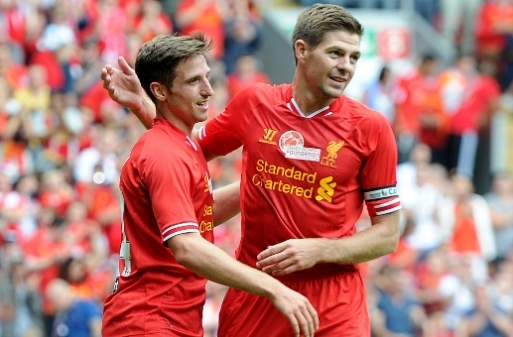 Goals from Joe Allen and Jordan Henderson sealed a impressive win in Steven Gerrard’s testimonial match. 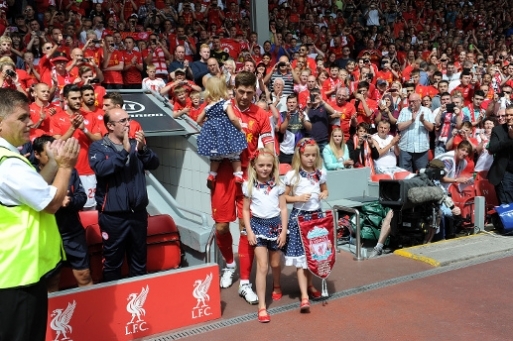 A sell out crowd packed Anfield as they honoured Steven Gerrard’s glittering 15 year career with the Reds. Iconic Liverpool legends Jamie Carragher and Robbie Fowler started on the bench for the Reds, but both made appearances to pay tribute to Steven Gerrard. 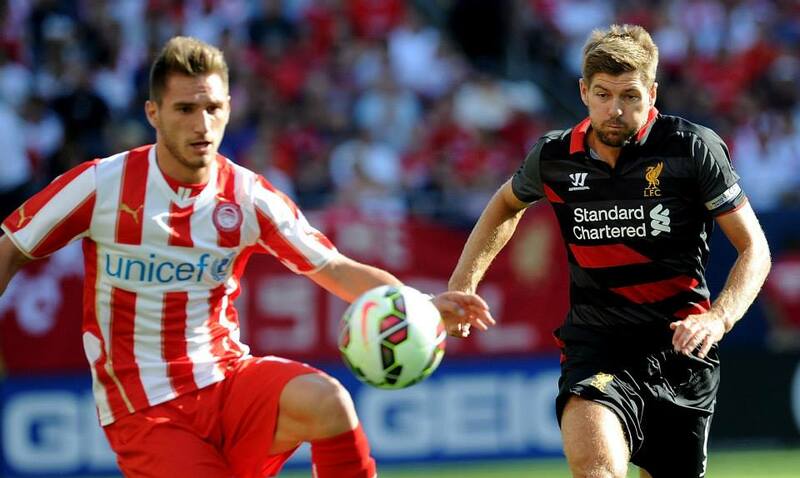 The Reds dominated proceedings of the match from start to finish and gave their Greek opponents Olympicos no chances at all. Just four minutes into the match Allen would find Iago Aspas with a great pass but the new signing was unfortunately denied a goal as the keeper did well to save from close range. The pair continued to link up well, initially coming agonisingly close before their dividends paid off immediately after. An extravagant flick from Aspas found Joe Allen in the six yard box delightfully but the 23-year-old, somehow, fired the ball on the half-volley over the bar before his shooting boots were back on seconds later. The combination linked up delightfully again as Aspas fired in a ball across the goal, finding Allen in yards of space as he tapped the ball into a gaping goal to make it 1-0 Liverpool. 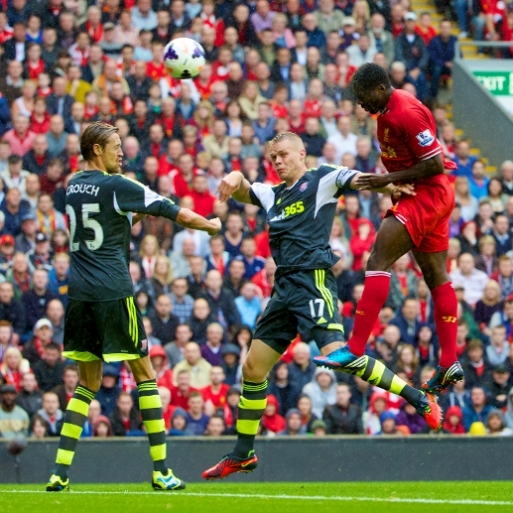 Liverpool continued to press for the ball and Glen Johnson nearly scored Liverpool’s second just five minutes later. The energetic full back cut inside onto his left foot before piling in a powerful strike, which flew just wide of the post. Steven Gerrard was pulling the strings in the centre of the park but so nearly set up Joe Allen, in which Allen should of scored his second of the game. The Liverpool skipper whipped in the ball from the right hand side finding Allen perfectly in the box, but the Welshman couldn’t get enough contact on his header as he headed down and wide. Liverpool continued in the same vain in the second half as Countinho find Raheem Sterling with a fantastic pass, with the 18-year-old latching onto the pass but his effort bounced just wide of the post after a composed chip over the onrushing goalkeeper. Sterling’s passing accuracy could not be questioned shortly after though after his defence splitting pass found substitute Henderson who chipper over the keeper to find the back of the net to make it 2-0 Liverpool, only being on the pitch for twelve seconds. With just less than 20 minutes remaining of the match Liverpool introduced former Reds idol Robbie Fowler to the fray of the match. A near dream scenario happened for Liverpool as Suarez found Gerrard with the captain finding Robbie Fowler with a great pass but his shot deflected into the side netting. In the closing minutes of the game, Steven Gerrard was withdrawn for Jay Spearing so the Anfield skipper could get a well deserved standing ovation from a rapturous Anfield crowd. 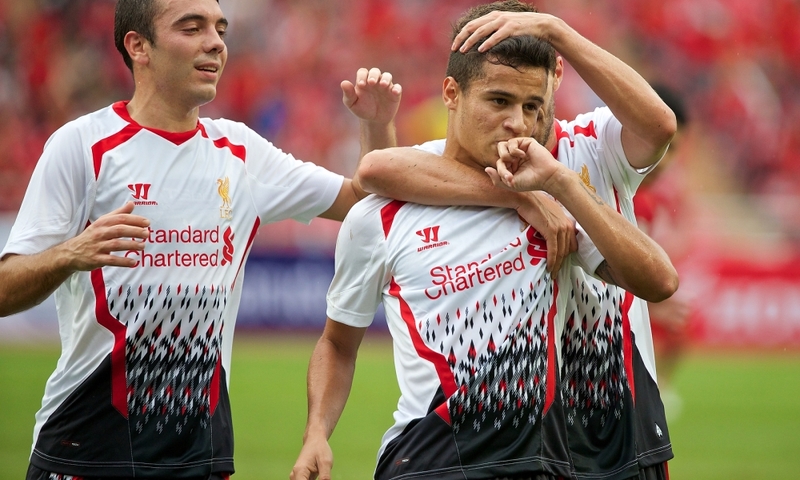 Liverpool recorded a fourth straight pre-season win as they signed off their 2013 summer tour with a 3-0 victory over the Thailand national team. Philippe Coutinho, Iago Aspas and Steven Gerrard scored the goals on a day when many of Brendan Rodgers’ senior players featured for 90 minutes for the first time this summer. The squad will now head straight for the airport, waving goodbye to their incredible Thai supporters and flying home to Merseyside. Coutinho might have opened the scoring on 11 minutes but his extravagance in scissor-kicking Glen Johnson’s superb floating cross did not pay dividends. But the Brazilian wouldn’t be denied for long. On 16 minutes he pick-pocketed possession before displaying outrageous footwork that left his pursuer floored and opened space to slot into the bottom corner. The Reds continued to create chances against a national side who knocked China for five recently, while Thailand’s best effort in the first half was a rocket shot from 20 yards that Simon Mignolet had to be sharp to palm away. Within four minutes of the restart it was 2-0 when Coutinho threaded a ball towards Aspas, who beat a defender with a Maradona spin before placing the ball beyond the goalkeeper’s reach to claim his third goal since clinching a transfer from Celta Vigo. It was Gerrard who chipped in next on 59 minutes as Joe Allen sprinted clear in midfield, feeding Aspas, who in turn laid the ball off to his skipper. 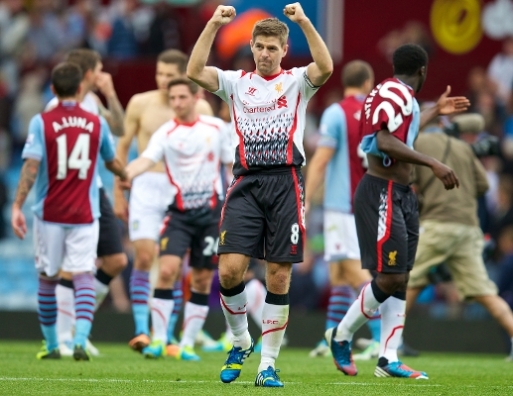 Gerrard – the undisputed star attraction for fans during the tour – showed poise to dink over the flailing defenders and ‘keeper. Aspas and Fabio Borini then made way for Luis Suarez and Jordon Ibe but there wasn’t the raft of early changes we saw in previous tour encounters. Kolo Toure and Coutinho – who both missed the Reds’ last game through injury – were replaced by Martin Skrtel and Jordan Henderson, while everyone else lasted until the closing stages or the final whistle. Away from the sidelines, Suarez and Gerrard both hit the crossbar, Henderson had an effort stopped on the line and Ibe blasted into the side netting – but the passionate fans who filled the Thai national stadium were not treated to any more goals. Controversial Liverpool striker Luis Suarez returned in a 2-0 Liverpool win against Melbourne Victory at the jam packed MCG Arena in Australia. All the build-up before the match was the 40,000,001 million bid that Arsenal made for the Liverpool star, and Suarez made sure all the talk was still on him as he singlehandedly set up Iago Aspas for a tap-in to make it 2-0. 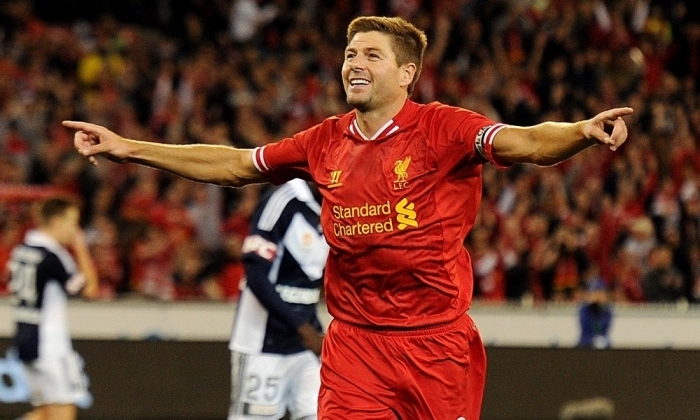 Goals from Liverpool captain Steven Gerrard and Iago Aspas put the game to bed against a resilient Melbourne Victory team, but the fans were eagerly anticipating Suarez’s arrival just past the 70th minute mark off the match. Liverpool got there first chance of the match in the 5th minute as Steven Gerrard played a beautiful ball over the top for Raheem Sterling who struck the ball just wide off the post. The 18-year-old continued to look lively as he hit a ball from outside of the box just too narrowly fly over the ball. 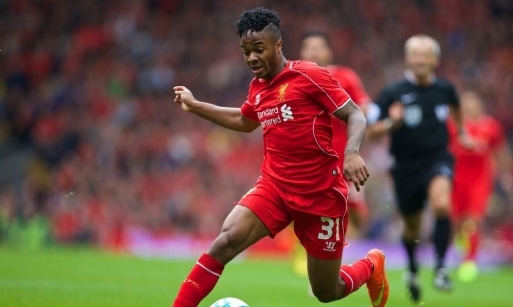 Raheem Sterling looked lively once again. Melbourne Victory were giving Liverpool a tough game when they had their first chance in the 20th minute as Navoo struck the ball from distance but Brad Jones comfortably saved. Steven Gerrard was Liverpool’s star performer as he played from a deeper position picking his moments when to surge forward. 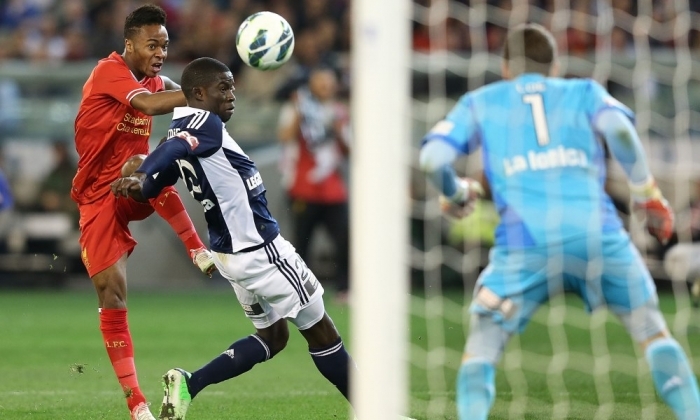 In the 20th minute the ball was played to Gerrard by Sterling but the 33-year-old had his deflected shot saved by the Melbourne Victory keeper. It was the Liverpool captain who gave Liverpool the lead as his back heel found Joe Allen who waited and bided his time and was looking for Fabio Borini, but the resulting ball fell to Gerrard inside the box for the skipper to finish it into the bottom corner. Gerrard continued to look lively as Jordan Ibe used great skill to get past his marker before striking the ball at the keeper, with the bouncing ball finding its way to Gerrard to blast just over the bar. 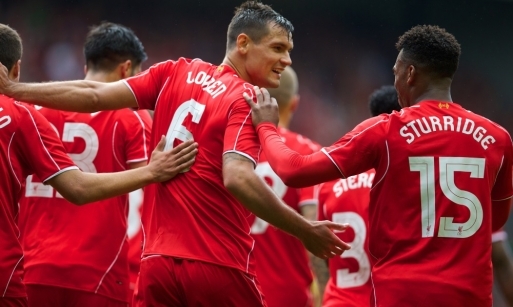 Liverpool made no changes at half-time and started the second half brightly. Martin Skrtel had a header from a Steven Gerrard corner touched just over by the keeper but the Slovakian defender had to be alert at the dangers of the other end of the pitch as a low ball was delivered in and Skrtel had to slide in to clear for a corner. Borini lightened up in the second half with two good chances the first being a great half-volley that was powerfully hit towards the keeper and the second was fantastic improvisation from the Italian as he received the ball before using a overhead kick to narrowly strike the ball just wide of the post. Liverpool made whole sail changes in 71st minute with the whole team coming off and the expected return of Luis Suarez to a standing ovation by the 95,000 Australian fans that came to see Liverpool play. Suarez never made his mark until the 90th minute when he thread a ball through to Iago Aspas, who struck the ball at the near post but the keeper got there to put it for a corner. The same combination worked from the corner as Downing played it short for Suarez who teased the ball in the box before finding Iago Aspas for a simple tap-in to make it 2-0 Liverpool and a good work out for them in Australia. Liverpool kicked of their tour in style as they comfortably beat Indonesia XI in their first clash of their three game tour. Liverpool started brightly with a goal in the 10th minute from Brazilian Coutinho and then wrapped it up late on when Raheem Sterling found the back of the net. 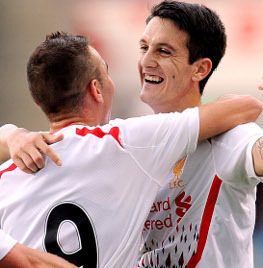 Reminiscent of Liverpool’s 4-0 win over Preston, Coutinho scored the first goal, where the Brazilian’s attempted pass to Luis Alberto ricocheted back to him, allowing the 21-year-old to surge into the box and coolly slide the ball under the diving Kurnia Meiga, scoring his second goal in pre-season. There was not much action in the next 20 minutes until Liverpool came agonisingly close to extending their lead when Stewart Downing met a Jose Enrique cross with a side-footed half volley, with the keeper doing well to smother the ball on the half hour mark. Minutes later Liverpool were again agonisingly close when Luis Alberto received the ball on the edge of the box from fellow Spaniard Iago Aspas and shifted the ball across before sending the ball crashing of the crossbar. Despite all the preasure that the Reds mounted Indonesia XI nearly found the back with a 30 yard strike. The forward drilled the ball from 30 yards and Simon Mignolet had a chance to showcase his skills as he dived across and sent the troubling effort wide. Iago Aspas was unlucky not to find the back of the net 10 minutes after the restart with some good movement from the Spaniard. Aspas raced clear from the Indonesian defence and rounded the goalkeeper before firing high and wide due to the ball bobbling up on the very dodgy turf. Liverpool made a whole sail of changes with 25 minutes to go, with winger Raheem Sterling making the best impact. Sterling first touch of the ball was a stunning 30 yard strike that rendered the goalkeeper useless but flew just wide of the post. The 18-year-old would then be the second player to be outdone by the crossbar when Oussama Assiadi whipped in the ball to Borini who missed the ball, but Sterling was waiting behind the Italian where he moved his body position quickly before powerfully driving the ball to the top of the crossbar. Sterling’s efforts, though, paid dividends in the 88th minute of the match with a counterattack started by Ibe making a very impressive run to find Assaidi, who unselfishly found Sterling for a simple tap-in inside the box to make it 2-0 in a very comfortable game for the Reds.